I have been a working Mom for the past 16 odd years. Maybe because I have seen my Mom do it and do it well, I have not thought there was an alternative. Aside from the economic aspect of being working Mom that really works well for us, living and raising kids now days, is no joke. My husband needed to go abroad for us to make ends meet. This is what makes this the H.O.P.E Summit so interesting for me. It is toted as an alternative to working in an office where most of the time to I am away from my kids. As much as I try to balance everything and be completely part of their everyday lives, I feel there could be much more I could do. Bestselling author and inspirational speaker Teresa Gumap-as Dumadag is organizing a parenting event dubbed as Hands-On Parents while Earning or H.O.P.E. Summit on August 8, 2015. It will be from 8:30 AM to 5:30 PM at the AVR of PLDT TelTech Building, Boni Avenue, Mandaluyong City. This whole day workshop on hands-on parenting and working smart in the new millennium seeks to inspire and teach parents how to marry hands-on parenting with earning for the family. Gumap-as Dumadag, who is an expert in designing programs used locally and abroad and in helping people grow and achieve their goals, will be the main speaker and facilitator of the workshop. 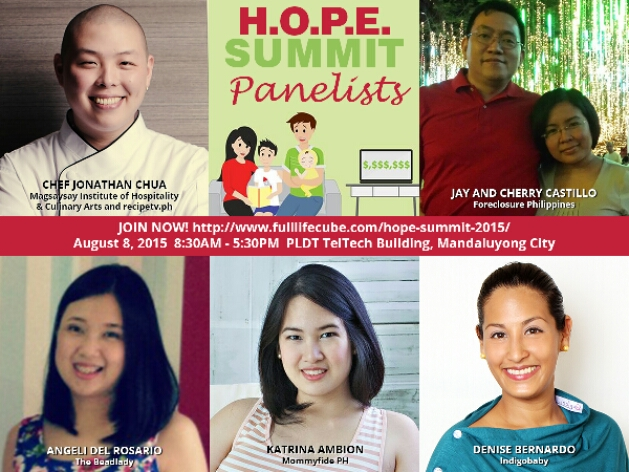 The other speakers in the summit include Martine de Luna, Jomar Hilario and Ginger Arboleda. 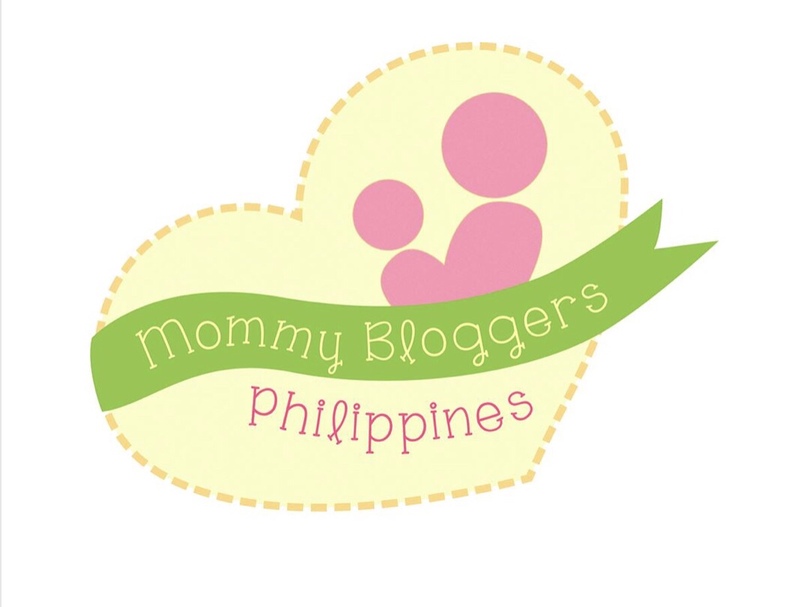 De Luna is a work-at-home advocate, award winning blogger and blog coach. Hilario is the Philippines’ Internet Marketing Guru who teaches individuals how to be virtual professionals and online business owners. Arboleda is a serial entrepreneur, business coach and blogger. All the speakers are hands-on parents to their kids while running their respective businesses. Guest panelists who are successful Hands-On Parents while Earning themselves will be part of the summit also. These include Denise Bernardo of Indigobaby, Angeli Del Rosario of The Beadlady, Katrina Ambion of Mommyfide PH, Chef Jonathan Chua of Magsaysay Institute of Hospitality and Culinary Arts and Jay and Cherry Castillo of Foreclosure Philippines. ·to enable parents to discover their big why in aspiring to be Hands-On Parents while Earning (HOPE). ·to enable parents to come up with a clear and compelling vision for their children and for themselves as parents and as earning individuals. ·to help parents to come up with a list of new habits that they can easily and consistently implement after the workshop so they can be more involved in their children’s lives. ·to consistently implement after the workshop so they can be more involved in their children’s lives. ·to help parents discover ways to work smarter so they can free up more time in their schedules to bond with their children. 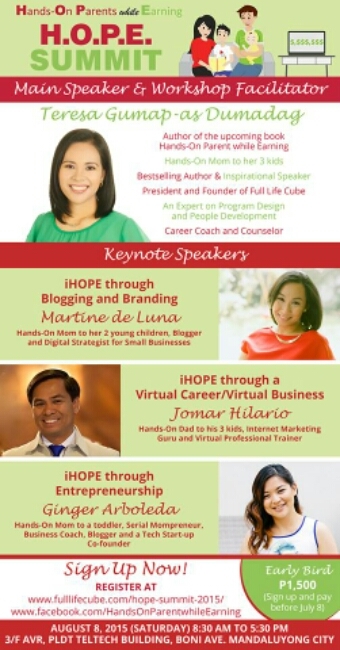 ·to inspire moms and dads to be hands-on even while earning for their families and to learn tips and strategies on how to be successful in their careers/businesses through the stories of the featured moms and dads (guests) in the iHOPE Summit. ·to introduce different earning options for parents while being actively involved in their children’s lives. ·to give parents an opportunity to meet and interact with other parents who also want to become H.O.P.E. (Hands-On Parents while Earning). Gumap-as Dumadag is the founder of the Hands-On Parents while Earning Network. Like Hands-On Parents while Earning on Facebook to join the H.O.P.E. Network and to get regular tips and doses of inspiration on hands-on parenting, work and business. The workshop is valued at P3,500 per head at least but Gumap-as Dumadag wanted to help as many families as she can; so, she found a way to make the workshop more affordable to parents. Thus, attendees get a 43% discounted rate even as they pay the regular rate of P2,000 per head. Couples are encouraged to attend together through the couple rate of P3,000 only. Click here to read more details about the summit and to register to this life-changing event. The H.O.P.E. Summit is co-presented by Full Life Cube Publishing and Events Services, Sun Life Financial and PLDT Home Telpad. Participants of the summit will get a chance to win exciting prizes during the raffle from its sponsors which include Indigobaby, The Beadlady, Mommyfide PH, Bert Lozada Swim School, Gymboree Play and Music Philippines and Halo Philippines. One of the prizes to be raffled off is a free annual membership to Gymboree Play and Music Philippines worth P2,000! Winning this will not only translate into savings but many precious bonding moments for the lucky parent and child. Participants will also receive freebies like P500 gift certificates from Lozada Swim School, copies of Mustard magazine for kids and so much more. For updates about the H.O.P.E. Summit, please like and visit https://www.facebook.com/events/419373114931304/.